Another rainy day in sunny, sunny London! It’s been raining pretty much all week, but can’t complain as the U.K. is officially in drought. We need the rain to wash away the dirt and provide some sustenance to the green fields beyond the cityscape. So along with thousands of other rain averse people, we decided to head to Westfield in Stratford City, the Olympic Town. We browsed the Lego shop and went a bit googoo over the Duplo sets that we planned to get Amazing M when she is old enough to know not to eat the plastic pieces. There was even a set with cupcakes pieces! 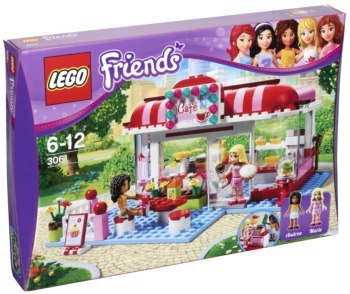 So as not to alienate the pre-teen girl market, the Friends Range was born. I was seriously contemplating on getting either the Beauty Parlour or Cafe. One day I will succumb to the inner child in me. Hey, delicious sister! Does this tickle your fancy? I can’t really concentrate right now as a documentary about the Indian Ocean is on, and the dream like views of Seychelles is calling me. Oh. My. Word. I have always wanted to go there, but I need to be there right now! No words of wisdom from me for now, except- happiness and joy within breeds happiness and joy without. This weekend has been proof of that. Gotta go and enjoy the turtles and crystal clear beaches. In the words of Liz Lemon, ‘I want to go to there.’ For me, there is London! Oh well, see you in 2013, fingers crossed! Where are you going on your holiday btw? Is that next week? I hope to see you next year in lovely London!! I always wanted a Lego world in my own home. One day….